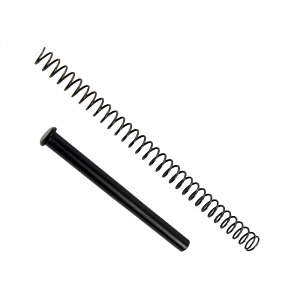 Excellent guide rod with spring as all Gray Guns products. I received the guide rod away in a very short time. It was a direct replacement for Sig P320. I had hoped that it would help with the stiff takedown lever since some had attributed that to the guide rod. It did actually seem to work easier afterward. Still have not fired the weapon after replacement and am looking forward to that. Not much heavier than the original p320 guide rod but easy change and the new spring is MUCH appreciated! Much softer recoil, improved my groups from less recoil. Much more fun to shoot from such a simple modification.